We have come up with an exhaustive research report on the global market for advanced Computed Tomography (CT) scanners that supports the reader by assisting him in slating and accumulating all possible strategies based on valuable insights in order to maintain the correct tempo with the changing dynamics of the market in the present as well as few years down the line. Credibility of the researched data and statistics lies in the uniqueness of the research methodology which ensures higher accuracy. In depth assessment of the global advanced CT scanners market is underpinned by an extensive research process that includes both secondary and primary research to obtain relevant numbers. The data collected undergoes several funnels of validation and re-examination at each step, as the research progresses. This ensures delivering value with data having higher degree of accuracy. The expert opinions of the market observers and the domain experts is extrapolated and triangulation of these enables the analysts to arrive at a much accurate global market representation. An entire section in the global advanced CT scanners market is dedicated to competition. The competitors, their promotion strategies, their product portfolios, pricing strategies, distribution channels, etc., is highlighted to understand their key mantras to achieve stability in the respective markets. This section can enable the reader to get a realistic view of the market, get intelligence on supply and demand side of the market which will assist in opting strategies similar to or even more effective than those already applied. This gives a complete package of intelligence keeping in view all the angles which directly or indirectly influence the global advanced CT scanners market. Deep diving in the segments present in the advanced CT scanners market has enabled the analysts to achieve enormous data and statistics which have been represented in a tabular format along with graphical images and representations. The segment wise in-depth analysis narrows down the research providing actionable insights. Just a click away, the user can avail information on any segment, any region and any technology. Real time analysis has increased the weightage of the research giving a holistic image to the global advanced CT scanners market research report which assists the viewers in slating important corporate strategies pertaining to price, place and promotion. The research report starts with the executive summary followed by overview of the advanced CT scanners market and concludes with key industry recommendations by domain experts based on the data and statistical analysis along with forecasts which can help to keep up with the ever changing dynamic market. According to the analysis done by Persistence Market Research, the global advanced computed tomography scanners market is experiencing steady rise since past years. The global market has witnessed positive yet slow growth since 2012 and is expected to register a high value CAGR of 7.9% throughout the period of forecast. In 2017, the global advanced computed tomography scanners market reflected an estimate of around US$ 1300 Mn in 2017 and is anticipated to touch a value higher than US$ 2900 Mn by the end of the year of assessment. This growth can be attributed to the increasing demand for advanced computed tomography scanners for diagnosis in carious healthcare facilities across the globe, rising incidences of ageing population, increasing need for medical imaging and increasing preference of minimally invasive diagnostic procedures. However, factors such as adoption of refurbished equipment and lack of skilled and trained professionals are posing challenges to the growth of the global market. Since past few years, government policies in Middle East and Africa and Asia Pacific regions are encouraging start-up companies and multi-national corporations to focus on developments in the healthcare industry, especially in the medical imaging sector. Several players in medical imaging are shifting their focus towards establishing string foothold in emerging economies owing to favorable economic conditions. Emerging economies such as India has introduced new policies in order to attract MNCs and start-up companies across several healthcare domains. As per these policies, start-ups in India are expected from tax liabilities for the first three years after establishment. Moreover, costs associated with patent protection are also subsidized. Per capita expenditure on healthcare is rising globally. The ability and willingness of people to invest on wellness has led to an incremental shift in the expenditure. This fact is expected to trigger the global market advanced CT scanners market growth in the coming years. Moreover, increasing use of diagnostic imaging influences the need for advanced technology computed tomography scanners, which in turn is expected to spur the demand for advanced CT scanners market at a global level during the forecast period. Advanced computed tomography scanners are categorized based on product types. Of the various product types, low dose computed tomography scanners have witnessed high adoption since past several years. 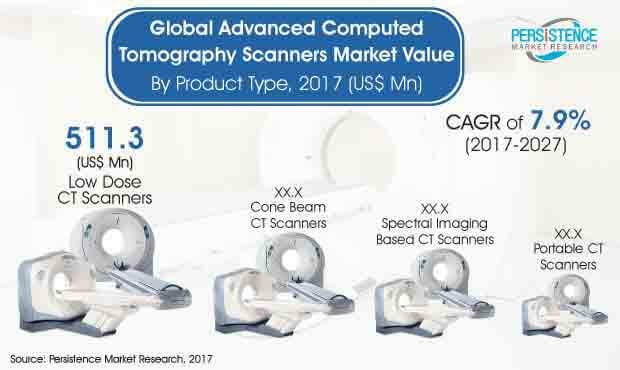 The low dost CT scanners segment is estimated to reach a significant market valuation by the end of the year of assessment, thus leading the global market. The low dost CT scanner segment was valued at about US$ 500 Mn in 2017. It is projected to expand at a robust value CAGR of 7.9% throughout the period of forecast (2017-2027). Cone beam computed tomography scanners are being increasingly used in hospitals an ambulatory surgical centers. The use of cone beam computed tomography scanners is expected to rise at a high rate in the coming years. This segment is the second largest with respect to market valuation and is projected to expand at the highest value CAGR during the assessment period. The cone beam CT scanners segment is estimated to touch a valuation of more than US$ 900 Mn by the end of the year of assessment.